These are solutions of known and exact pH. If your pH meter doesn’t read pH 7 (or pH 4) when the probe is put into the buffer then the meter is wrong and needs calibrating. 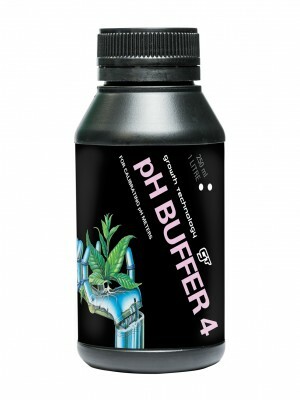 We recommend that the meter is checked with pH 7 Buffer at least once a week, and checked with pH 4 buffer at least monthly. Each pH meter comes with instructions on how to calibrate the meter. Pour enough buffer from the bottle to cover the glass end of the probe when calibrating, and discard the solution after. It isn’t best practice to return used buffer to the bottle it came from. Correct pH of hydroponic nutrient solutions is critical. Mineral absorption by the roots is pH dependent. If the pH is outside the range of pH 5.5 to pH 6.5 then plants will have increasing difficulty absorbing minerals and a mineral deficiency would soon develop even though in all other respects the hydroponic nutrient is OK. The pH should be checked when the nutrient solution is first made, and if used in a recirculating system, the pH should be checked every day. Available in 250 ml and 1 litre bottles.